A private view of the installation took place in the evening of the 8 September; we were delighted to welcome especially our guest speaker, Kasia Redzisz who is the Senior Curator at the Tate Liverpool and Miroslaw’s agent from the White Cube Gallery in London, Sarah Berjerano. Miroslaw Balka & Kasia Redzisz meeting Richard Demarco. Sarah Berjerano is in the background. Magdalena Gemra – Miroslaw’s assistant on the right. Alongside Miroslaw and his assistant Magda, were many other special guests including dignitaries and officers from Windermere Town Council, South Lakes District Council and Cumbria County Council. 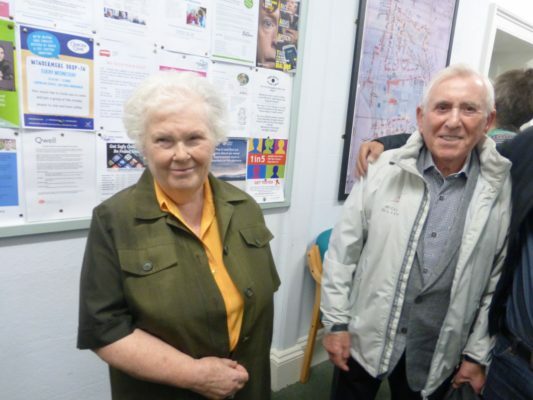 We were thrilled that three of the Holocaust Survivors, Joanna Millan, Ike Alterman and Sam Gontarz also came together with friends and family, some of whom had travelled long distances to meet with Miroslaw and to see his work. We were delighted to especially open the gallery on 27 August for Sam and his family to view the exhibition. Sam was one of the ‘Windermere Children’ who had stayed in the Lake District in 1945 and he had especially chosen to spend his 90th birthday with his children and grandchildren at Windermere. 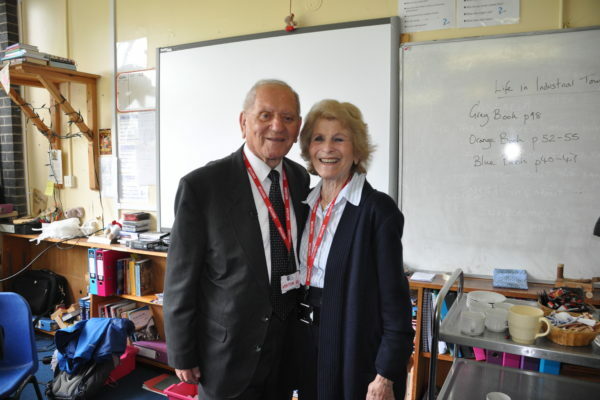 Arek, one of the child Holocaust Survivors, made a return visit with his wife Jean to talk to some of the students at the Lakes School and to be filmed for a broadcast in 2018. Areak regularly visits the Lakes School on the former site of the Calgarth Estate where he stayed in 1945. Trevor Avery & Rose Smith attended meetings at Manchester Town Hall & Downing Street to view and discuss with others the shortlisted designs for a new Memorial & Learning Centre to be built next to the Palace of Westminster. No decisions will be made until Autumn 2017, but the Holocaust Commission Committee that was set up to carry out the conclusions of the Holocaust Commission Report 2015, are seeking a wide variety of views. 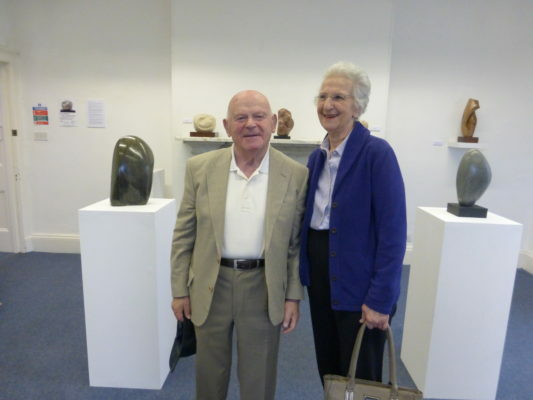 Arza and Ben Helfgott, together with family and friends visited the exhibition in June 2017. Arza’s husband Ben is one of the child Holocaust survivors who came to the Lake District in 1945. We were delighted to attend the reunion in London on 1 May. The Reunion is always well attended by as many of the remaining child Holocaust survivors who could make the event, their children and grandchildren. This year the Reunion celebrated the liberation of the children and their arrival in Windermere. 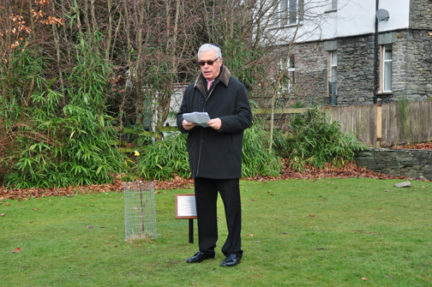 A special oak tree was commemorated at a poignant ceremony to remember the child Holocaust Survivors. The ceremony was held in the grounds of the Lakes School at Troutbeck Bridge as the school stands on the grounds of the former site of Calgarth Estate where the children stayed for several months in 1945. The oak tree was grown from an acorn gifted to Trevor Avery on a visit to Oswieçim, several years’ ago. 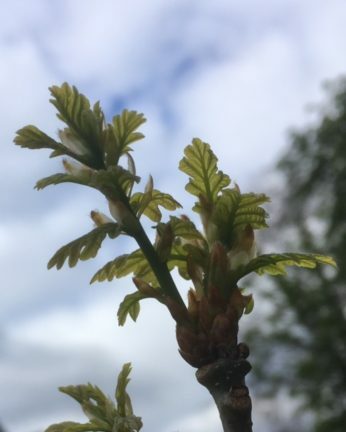 It was planted in the grounds by Ben Helfgott, an Honorary President of the Holocaust Memorial Day Trust and one of the children who came to the Lake District. We were delighted to attend the 71st Reunion of the ’45 Aid Society in London in May 2016. The ’45 Aid Society – Holocaust Survivors’ was set up in 1963 by the first child Survivors who arrived in the UK in 1945 – some of whom stayed in Windermere . “It’s mission has been to remember those who were lost, to help their members who needed help; to teach the lessons of the Holocaust; to spread the message of tolerance; and to help others more widely”. Those Survivors who were able, together with their children and grandchildren, attended the Reunion. A special presentation was made to Ben Helfgott, who is now retiring after many years as Chairman of the Society. In response to their kind invitation, we visited the Holocaust Survivors’ Centre in North London, where a number of the children, who had stayed in the Lake District in 1945, were able to meet with us. It was a rare opportunity for those at the LDHP Project to talk with these Survivors, their wives and second and third generations. The Holocaust Survivor’s Centre is the only centre in the UK that was designed specifically for Holocaust Survivors. It provides a programme of “social, cultural and therapeutic events”. Another Space/LDHP announced the launch of the Alfred Huberman Writing Award at the Lakes School, Windermere on Holocaust Memorial Day on the 27 January 2016. Alfred is one of the remarkable child Holocaust Survivors who came to the Lake District directly from the concentration camps in 1945, played a central role in HMD 2016 commemorations in Windermere. His wife Shirley and their daughter Caroline travelled from Brighton and were at the event. They spoke movingly of their father and of his time both at Windermere and his later life. The family has been very supportive of Another Space and the LDHP and their support has enabled the writing Award initiative. They see it as a perfect way to continue Alfred’s work as he spoke to many students during his lifetime about the Holocaust. The writing award is open to students initially at secondary schools in the South Lakes, Cumbria and who study the Holocaust as part of their curriculum. Judging took place in June/July 2017. The 70th anniversary of the arrival of the child Holocaust survivors in the Lake District on 14 August 1945. 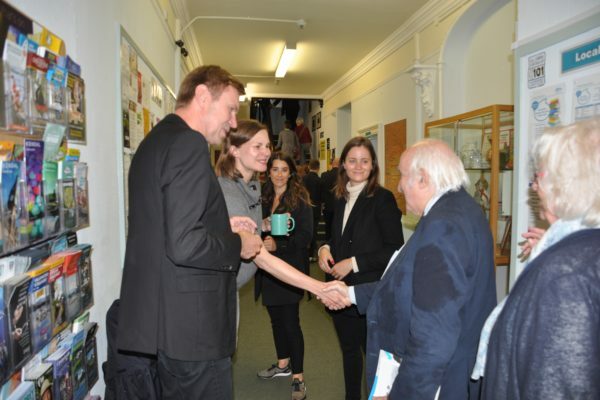 On 13 August 2015, Another Space were delighted to welcome a large number of particularly special guests to an event in the grounds and building of the Lake District Holocaust Project at Windermere Library to commemorate the seventieth anniversary of the children’s arrival. It was especially poignant that some of the remaining survivors were able to attend with their families, alongside wives and sons and daughters of those who have now died. Other guests included Sir Eric Pickles MP (the Prime Minister’s new Special Envoy for post Holocaust issues), Suzanne Bardgett (Head of Research IWM London), Jonathan Arkush (President Board of Deputies of British Jews), Paul Anticoni (President World Jewish Relief), Helen Myer (Holocaust Commission, Downing Street), David Southward MBE (Cabinet Member Cumbria County Council), Councillor Chris Hogg (Mayor of Kendal) and many more. Moving speeches were made by Sir Eric, Suzanne Bardgett, Ben Helfgott MBE (Chairman of 45 Aid Society) and Trevor Avery (Director of Another Space). 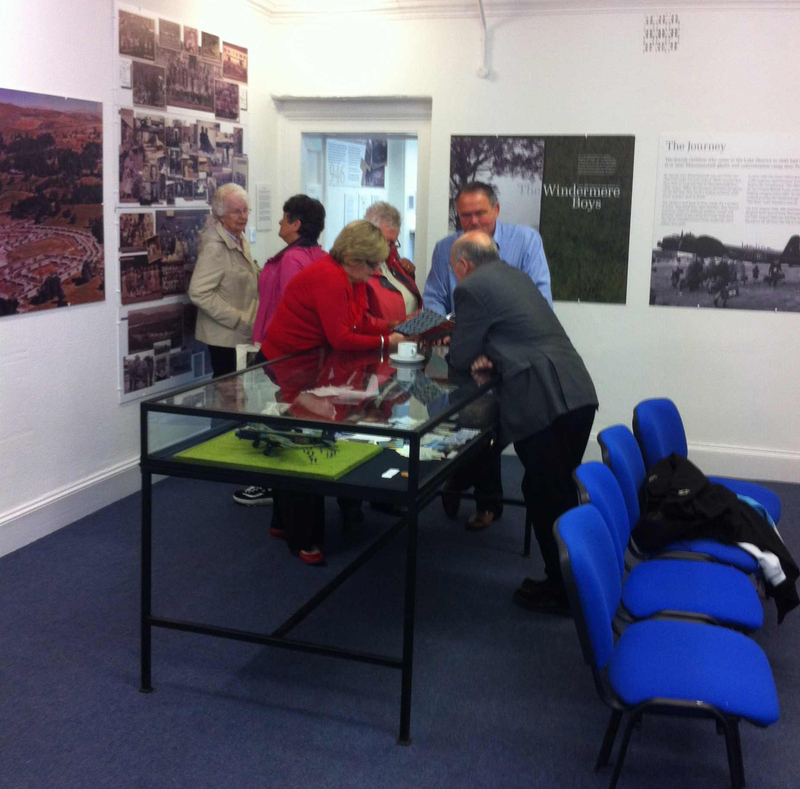 The guests were then invited to look at exhibits and films, both in the permanent exhibition and those especially commissioned for the event. These included the ’45 Aid Society Memory Quilt for the Boys’, an installation by the international and acclaimed artist, Miroslaw Balka and ‘Flowers of Auschwitz’ an exhibition by Trevor Avery & Rose Smith. Another Space welcomed residents and families from Windermere and the South Lakes to the preview of an exhibition at the end of the project in June 2015. The story of the estate has its roots in the wartime housing scheme of Calgarth Estate which had originally been built to house the workers of the Sunderland Flying Boats. At the end of World War Two, the three hundred child Holocaust Survivors had been brought to Calgarth where they stayed for several months. Eventually the residents were rehoused on the Droomer Estate in Windermere. Another Space interviewed many of the local residents, some remembering the move from Calgarth, many describing their school days and life in Windermere from the early 1950s. 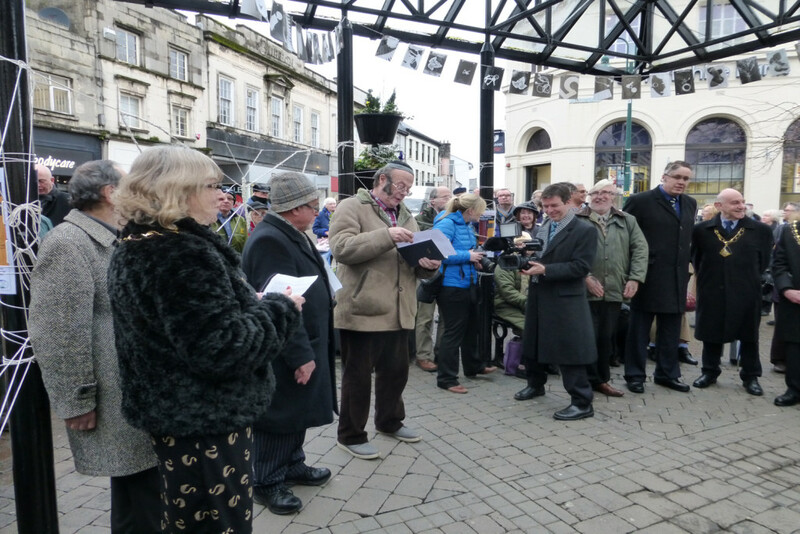 A commemorative service was held at the Birdcage in Kendal followed by a concert in the Town Hall in January. To mark this highly poignant memorial, Joe Berger, one of the child survivors, lit a candle, designed by Anish Kapoor, before the concert. 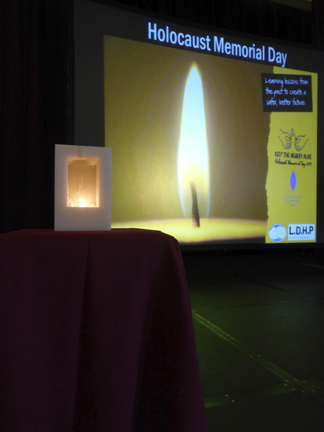 This formed part of a national “Seventy Candles for Seventy Years” initiative, which drew together Holocaust Memorial Day events across Britain. 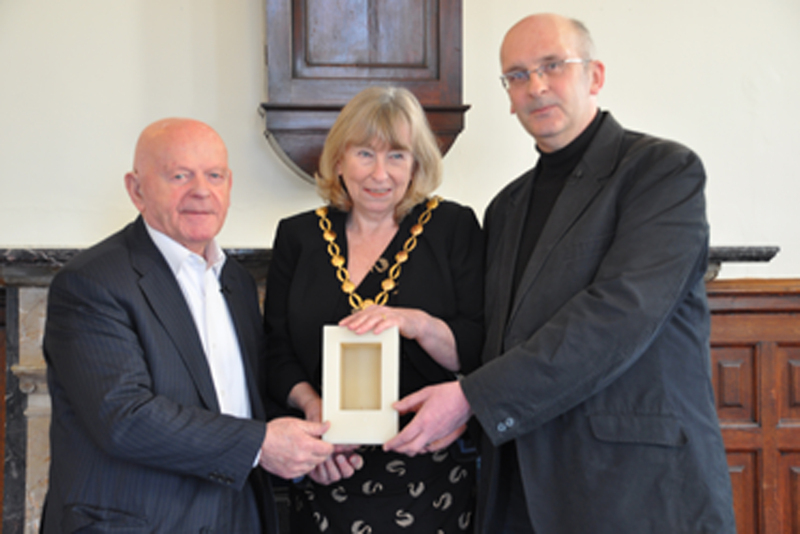 The candle had been presented earlier in the month to Trevor Avery and Councillor Westwood by Ben Helfgott, MBE, who especially travelled up to Kendal. 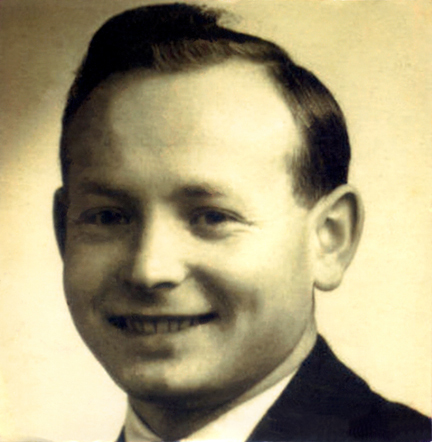 Ben was one of the child Holocaust Survivors who arrived in the Lake District in August 1945. 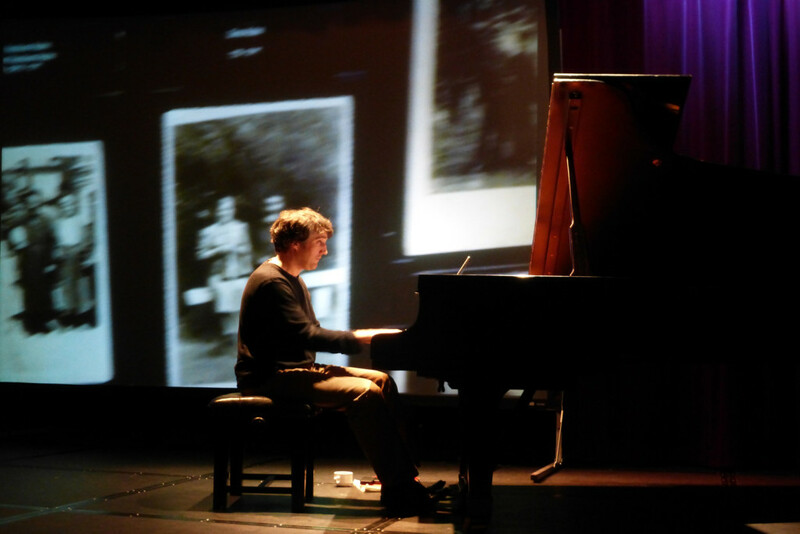 Guest speaker was Susan Stein from the USA and classical pianist Anthony Hewitt performed pieces by some Polish composers, two of whom had died in concentration camps. South Lakeland District Council presented this event in Kendal in partnership with the Lake District Holocaust Project.